A three-alarm fire sparked by a halogen lamp ripped through a South End apartment building Saturday morning, forcing out five adults and two children who lived there and temporarily displacing a neighbor, fire officials said. Firefighters received a call around 7:20 a.m. reporting the fire at 64 Rutland St., a four-story brick building housing four apartments, the Boston Fire Department said. Responders saw heavy fire as they arrived at the building, with flames raging on the third floor. Efforts to battle the blaze were hampered by a BMW station wagon parked illegally in front of a nearby fire hydrant. 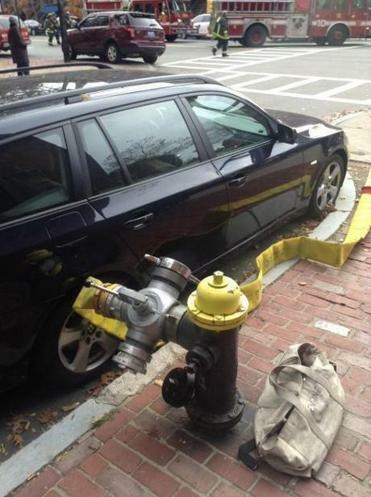 “This never helps,” the department tweeted, along with a picture of the car blocking the hydrant. Firefighters were unable to use water from that source, as the car was too close to the hydrant for water to run through the kinked hose, Boston Fire Department spokesman Steve MacDonald said. The owner of the vehicle, Jeffrey Conklin, a retired software executive, said he was “sick to my stomach” after being contacted by the Globe Sunday afternoon and told that his 2008 blue BMW station wagon was near the hydrant and blocking the work of firefighters. He said he had not driven the car since Thursday night, after parking it on Rutland Street, just two blocks from his home. Conklin insisted he is not a “negligent person” and believes he must have missed seeing the hydrant when parking in the dark. In a subsequent conversation with the Globe, Conklin, who sounded deeply distraught, said he visited his local fire station with deep apologies. He was told that his car had been towed with at least one ticket on it — probably a $100 fine for parking too close to a hydrant. MacDonald said the fire apparently broke out when a halogen lamp came into contact with a mattress in the front third-floor bedroom. It was put out by about 8 a.m.
Five adults and two children escaped from the three occupied apartments in the building, which had working smoke detectors, MacDonald said. 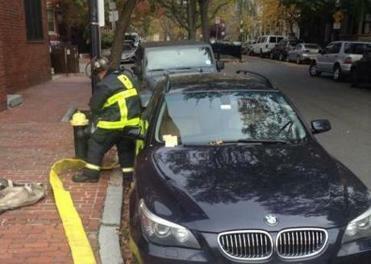 A car parked in front of a hydrant near the South End fire. The fire was mostly contained in the third-floor apartment, which “will be unoccupied for a while,” MacDonald said. One woman who lives next door will be displaced for a few days because of smoke damage, he said. There was some water damage to the burned apartment building. Fire officials estimate the total damage at about $300,000. Boston EMS transported and treated one adult and three children for anxiety. One of the children was visiting the apartment’s residents, MacDonald said. Two firefighters were treated for minor injuries — one with an injured shoulder, and one with an injured thumb, fire officials said. The apartment is controlled by the Boston Housing Authority, which was assisting the displaced residents, MacDonald said. Patricia Wen of the Globe staff contributed to this report. Jennifer Smith can be reached at jennifer.smith@globe.com.